Managing stress just got easierThis book is written for managers as a simple, practical guide to the principles and techniques for managing stress at work. 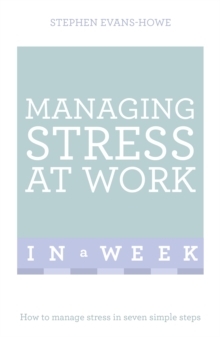 It looks at stress from an organizational perspective as well as highlighting practical steps individual managers can take to enable them to gain competitive advantage through effective management of their most valuable asset - their people. Even if you have no direct line-management responsibilities now, you can use what you have learnt to influence decision-makers,perhaps even your own line manager, to better manage stress in the workplace. This book will help you understand what stress is, why we get stressed and some of its physiological and psychological symptoms. You will learn about some of the background research into the psychology of stress and consider a variety of theories and models. More importantly, with this simple guidance, practical techniques and some relevant examples you will be able to create a challenging and supportive environment where people know what is expected, work hard, avoid burnout and make a real impact in your organization.